In Buffalo, we parked at the Buffalo KOA. Are you familiar with the “Longmire” TV show (6 seasons available on Netflix) or with the “Walt Longmire Mysteries” book series by Craig Johnson? 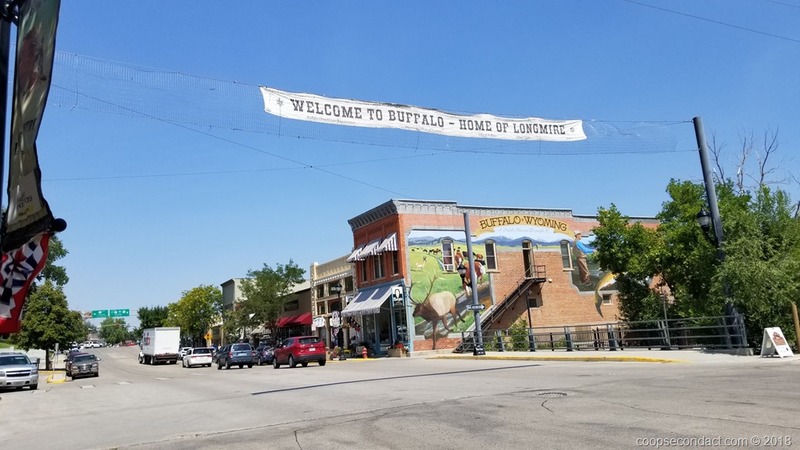 We very recently began watching the first season of the Longmire show but didn’t know much about it before we started looking for a place to stay in Buffalo, WY. We found out that during the time we had planned to visit Buffalo they were holding an event called “Longmire Days”. It turns out that Craig Johnson is from just outside Buffalo and his writing is based on Buffalo and Johnson County, which he has renamed Durant, WY, and Absaroka County in the books. The dedicated fan base has responded and turns up in large numbers for this 3 day event featuring appearances by Craig Johnson and many of the actors from the TV series. We were able to snag a place at a local RV park so that we could enjoy the town itself and a little of the fun around the “Longmire Days” events. This is a nice small town in the foothills of the Bighorn Mountains. It is located somewhat midway between the many attractions in the Black Hills area of South Dakota and Yellowstone National Park in western Wyoming. In Buffalo you will find the historic Occidental Hotel which dates from 1878. We took one day to drive west into the Bighorn Mountains to the town of Ten Sleep, WY. Along the way we passed through the beautiful Ten Sleep Canyon. The town used to be on a trail used by Native Americans to travel between two large camp areas. Those making the trip needed “ten sleeps” to reach this point which is how it got its name.